Some controversy exists about the relationship of Botryoid odontogenic cysts to lateral periodontal cysts, as some authors prefer to define a Botryoid odontogenic cyst as a "multicystic odontogenic lesion with histological characteristics of lateral periodontal cyst," or "cystic lesion similar to lateral periodontal cyst." 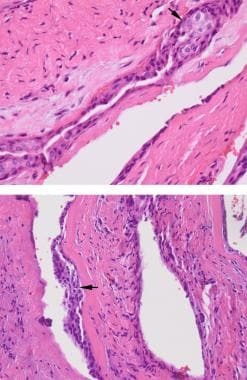 High et al proposed the term "polymorphic odontogenic cyst" to include lesions like Botryoid odontogenic cysts, glandular odontogenic cysts, and intraosseous mucoepidermoid carcinoma,  suggesting with this classification that careful histologic evaluation is necessary to confirm a diagnosis of Botryoid odontogenic cyst and separate it from any of these other possible lesions. Lateral periodontal cysts are most often identified during routine radiography, and the majority of patients are asymptomatic. Rarely, these cysts can present with expansion of the mandibular or maxillary bone or with perforation of the bone and communication with the overlying gingiva. 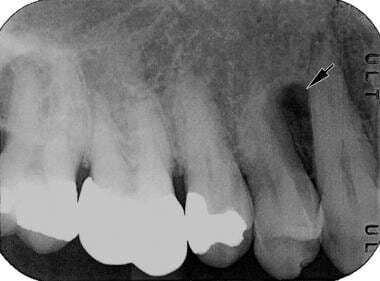 The clinical course of a lateral periodontal cyst is slow and insidious, with a growth rate of 0.7 mm per year. [11, 18] The vitality of the adjacent teeth is of significant importance in arriving at a presurgical working diagnosis of lateral periodontal cyst. However, if adjacent teeth are missing or have been treated endodontically, the differential diagnosis can be confusing. Lateral periodontal cyst presenting as a tear drop-shaped radiolucency between the maxillary cuspid and first bicuspid. The Botryoid lateral periodontal cyst variant typically presents as a multilocular radiolucency between teeth with a pattern that has some semblance to a cluster of grapes. These loculated clusters represent lobulations and thickened nodules of epithelium when viewed microscopically. The most common gross finding in a lateral periodontal cyst is that of a thin-walled, soft-tissue sac that has nodular excrescences in the sac wall. Note the thin 3- to 5-cell layer thick lining of a lateral periodontal cyst (arrows). 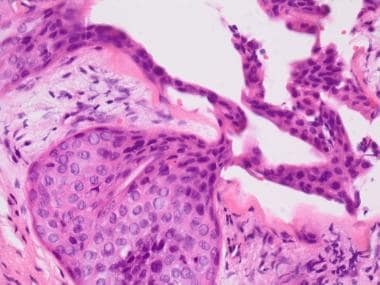 Note the unusual invaginating, nodular epithelial excrescence abutting the thin, fragmented lining of a Botryoid odontogenic cyst. 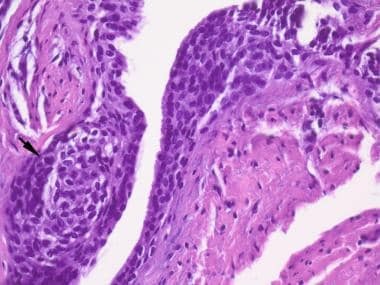 Typical luminal excrescence in the epithelium lining a Botryoid odontogenic cyst (arrow). Kramer IRH, Pindborg JJ, Shear M. WHO Histologic Typing of Odontogenic Tumours. 2nd ed. Geneva, Switzerland: Springer-Verlag; 1992. 34-118. Formoso Senande MF, Figueiredo R, Berini Aytes L, Gay Escoda C. Lateral periodontal cysts: a retrospective study of 11 cases. Med Oral Patol Oral Cir Bucal. 2008 May 1. 13(5):E313-7. [Medline]. Scuibba JJ, Fantasia JE, Kahn LB. Tumours and cysts of the jaws. Rosai J, Sobin L, eds. Atlas of Tumour Pathology. Washington, DC: Armed Forces Institute of Pathology; 2001. 26-31. Standish SM, Shafer WG. The lateral Periodontal cyst. J Periodontol. 1958. 29:27-33. Mendes RA, van der Waal I. An unusual clinicoradiographic presentation of a lateral periodontal cyst--report of two cases. Med Oral Patol Oral Cir Bucal. 2006 Mar 1. 11(2):E185-7. [Medline]. White SC, Pharoah MJ. Cysts of the jaws. White SC, Pharoah MJ, eds. Oral Radiology: Principles and Interpretation. 5th ed. St. Louis, Mo: Mosby; 2004. Mendez P, Junquera L, Gallego L, Baladrón J. Botryoid odontogenic cyst: clinical and pathological analysis in relation to recurrence. Med Oral Patol Oral Cir Bucal. 2007 Dec 1. 12(8):E594-8. [Medline]. Weathers DR, Waldron CA. Unusual multilocular cysts of the jaws (botryoid odontogenic cysts). Oral Surg Oral Med Oral Pathol. 1973 Aug. 36(2):235-41. [Medline]. Gurol M, Burkes EJ Jr, Jacoway J. Botryoid odontogenic cyst: analysis of 33 cases. J Periodontol. 1995 Dec. 66(12):1069-73. [Medline]. Greer RO Jr, Johnson M. Botryoid odontogenic cyst: clinicopathologic analysis of ten cases with three recurrences. J Oral Maxillofac Surg. 1988 Jul. 46(7):574-9. [Medline]. Carter LC, Carney YL, Perez-Pudlewski D. Lateral periodontal cyst. Multifactorial analysis of a previously unreported series. Oral Surg Oral Med Oral Pathol Oral Radiol Endod. 1996 Feb. 81(2):210-6. [Medline]. High AS, Main DM, Khoo SP, Pedlar J, Hume WJ. The polymorphous odontogenic cyst. J Oral Pathol Med. 1996 Jan. 25(1):25-31. [Medline]. Angelopoulou E, Angelopoulos AP. Lateral periodontal cyst. Review of the literature and report of a case. J Periodontol. 1990 Feb. 61(2):126-31. [Medline]. Shear M, Pindborg JJ. Microscopic features of the lateral periodontal cyst. Scand J Dent Res. 1975 Mar. 83(2):103-10. [Medline]. Wysocki GP, Brannon RB, Gardner DG, Sapp P. Histogenesis of the lateral periodontal cyst and the gingival cyst of the adult. Oral Surg Oral Med Oral Pathol. 1980 Oct. 50(4):327-34. [Medline]. Lynch DP, Madden CR. The botryoid odontogenic cyst. Report of a case and review of the literature. J Periodontol. 1985 Mar. 56(3):163-7. [Medline]. Fantasia JE. Lateral periodontal cyst. An analysis of forty-six cases. Oral Surg Oral Med Oral Pathol. 1979 Sep. 48(3):237-43. [Medline]. Legunn KM. Bilateral occurrence of the lateral periodontal cyst: a case report. Periodontal Case Rep. 1984. 6(2):56-9. [Medline]. Suljak JP, Bohay RN, Wysocki GP. Lateral periodontal cyst: a case report and review of the literature. J Can Dent Assoc. 1998 Jan. 64(1):48-51. [Medline]. Marx RE, Stern D. Oral and Maxillofacial Pathology: A Rationale for Diagnosis and Treatment. Carol Stream, Ill: Quintessence Publishing Co,; 2003. 585-88. A A, U U, Srinivas G V, Deviramisetty S, Hk P. Botryoid odontogenic cyst: a diagnostic chaos. J Clin Diagn Res. 2014 Dec. 8 (12):ZD11-3. [Medline]. So F, Daley TD, Jackson L, Wysocki GP. Immunohistochemical localization of fibroblast growth factors FGF-1 and FGF-2, and receptors FGFR2 and FGFR3 in the epithelium of human odontogenic cysts and tumors. J Oral Pathol Med. 2001 Aug. 30(7):428-33. [Medline]. Eliasson S, Isacsson G, Kondell PA. Lateral periodontal cysts. Clinical, radiographical and histopathological findings. Int J Oral Maxillofac Surg. 1989 Aug. 18(4):191-3. [Medline]. Meseli SE, Agrali OB, Peker O, Kuru L. Treatment of lateral periodontal cyst with guided tissue regeneration. Eur J Dent. 2014 Jul. 8 (3):419-23. [Medline]. Kaugars GE. Botryoid odontogenic cyst. Oral Surg Oral Med Oral Pathol. 1986 Nov. 62(5):555-9. [Medline]. Heikinheimo K, Happonen RP, Forssell K, Kuusilehto A, Virtanen I. A botryoid odontogenic cyst with multiple recurrences. Int J Oral Maxillofac Surg. 1989 Feb. 18(1):10-3. [Medline]. Baker RD, D'Onofrio ED, Corio RL, Crawford BE, Terry BC. Squamous-cell carcinoma arising in a lateral periodontal cyst. Oral Surg Oral Med Oral Pathol. 1979 Jun. 47(6):495-9. [Medline]. Eversole LR, Sabes WR, Rovin S. Aggressive growth and neoplastic potential of odontogenic cysts: with special reference to central epidermoid and mucoepidermoid carcinomas. Cancer. 1975 Jan. 35(1):270-82. [Medline].